Posted on 4, April 2016 by EuropaWire PR Editors | This entry was posted in Education, Netherlands, Science, Technology and tagged dilemma cube, Julieta Matos Castaño, University of Twente. Bookmark the permalink. ENSCHEDE, THE NETHERLANDS, 04-Apr-2016 — /EuropaWire/ — Julieta Matos Castaño, PhD student at the University of Twente, has developed a dilemma cube, to be used in large public-private projects. Her research shows that the tool promotes awareness and better cooperation between various parties. Ms Matos Castaño will receive her PhD on Friday 1 April from the Faculty of Engineering Technology (CTW) at the University of Twente. The Spanish-born PhD candidate has taken a close look at the decision-making processes involved in some of the large public-private projects in the Netherlands. This included going behind the scenes of the development of a multipurpose water-control structure in Rotterdam. She also conducted research at the Southwest Delta implementation programme. Due to the fact that a variety of functions such as water-control, leisure, nature, activity, energy and agriculture are combined in these projects, a large number of parties with wide-ranging interests are involved. This can make cooperation difficult. Research shows that many parties are not aware of all the different dilemmas that these multipurpose projects can entail. “It is therefore important to make the dilemmas more explicit to every participating party. Many people also view dilemmas as a problem and are not aware that they can also be a chance to come to a richer solution. Ms Matos Castaño says that cooperation becomes a whole lot easier once you are aware of this fact. 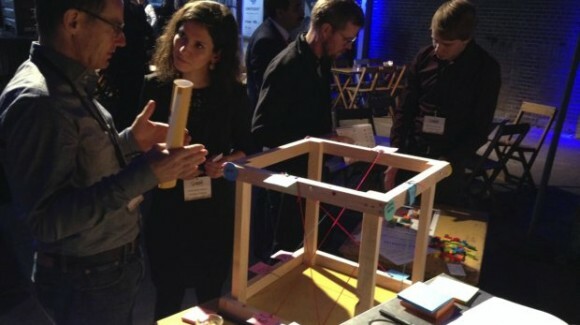 To make dilemmas visible and promote collaboration, the PhD candidate designed a dilemma cube with several colleagues. The cube is a square structure made of wood where every side represents a specific feature of the project, for example ‘nature’ or ‘leisure’. Each party indicates which actions they believe must be taken for the themes on each side of the cube. The other participants use red and green colours to indicate what they believe the effect of the activity in question will be. This shows at a glance which dilemmas are involved and how they can be solved. Ms Matos Castaño has successfully tested the dilemma cube during sessions on the topic of Building Information Modeling for a multipurpose project in the central Netherlands. Prorail and several consultancy firms have already used the tool. “The participants feel like the owners of the cube because they have designed it themselves. This makes the project a joint effort. The power of the dilemma cube is that it is a 3D construction in space and not an online tool. This creates more interaction between the parties and cooperation is more easily achieved”, says the researcher. Julieta Matos Castaño will obtain her PhD on Friday 1 April from the Faculty of Engineering Technology. She will be working as a change management consultant from 1 May and plans to regularly use the dilemma cube in her new position. Ms Matos Castaño will also be working on a popular version of her dissertation to make available to policy makers and to publish on www.dilemmacube.com.